Tis the season for Christmas goodies!! Seriously , what is Christmas without yummy treats? I have certain candies I make every year and this Christmas Cracker Candy is always at the top of my list. It is easy and quick so that fits into my busy schedule. 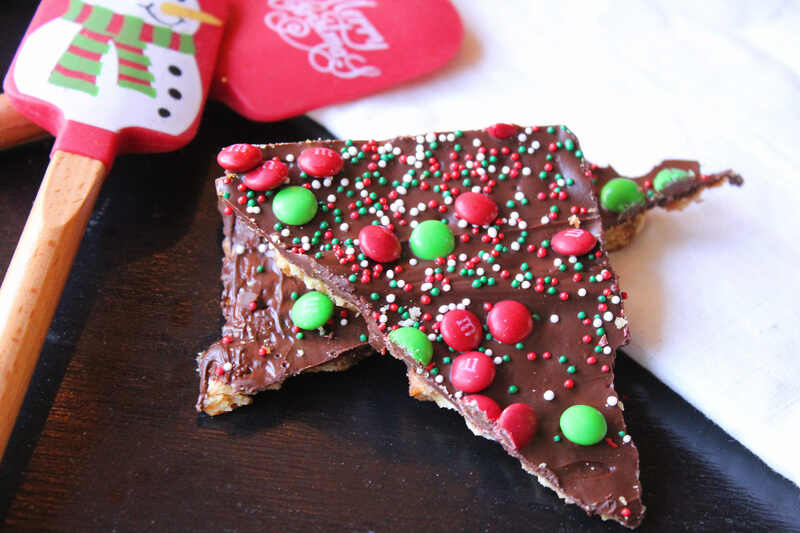 This cracker candy I jazzed up a bit with festive sprinkles and mini M&M’s. This stuff is so addictive and believe me it is hard to stop eating . I usually double this recipe since my boys will inhale one pan in 5 minutes flat, LOL. While I love this buttery toffee cracker candy I also always make cookies. Lots of cookies!! Check out a collection of my all time favorite cookies 20 Classic Cookie Recipes. One great thing about this recipe is it doesnt take fancy ingredients to have yummy results. 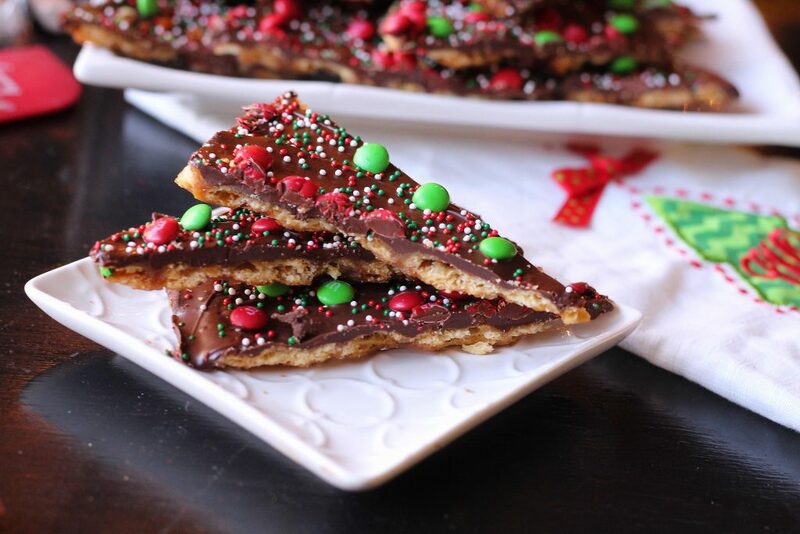 One sleeve of saltines, 1 stick of butter, 1/2 cup light brown sugar, 1 cup semi sweet chocolate chips , christmas sprinkles and mini Christmas M&M’s. Anyone that bakes have most of these items on hand , easy peasy. Start off by preheating the oven to 350 degrees ,line a cookie sheet with foil and spray it lightly with a little non stick spray. Line the the cookie sheet with the crackers. In a small sauce pan melt the butter and brown sugar together until it comes to boil , allow to boil for 2-3 minutes on medium heat. 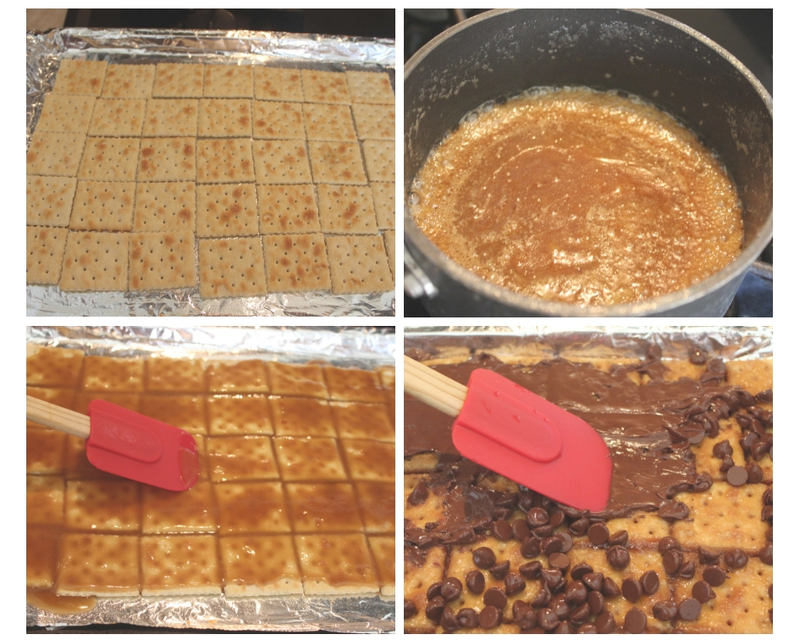 Now, drizzle the brown sugar mixture over the crackers evenly then take a rubber spatula spread it evenly. Bake in the preheated oven for 7 minutes. Remove the tray out of the oven, it the crackers have spread take a spatula push them together tightly. 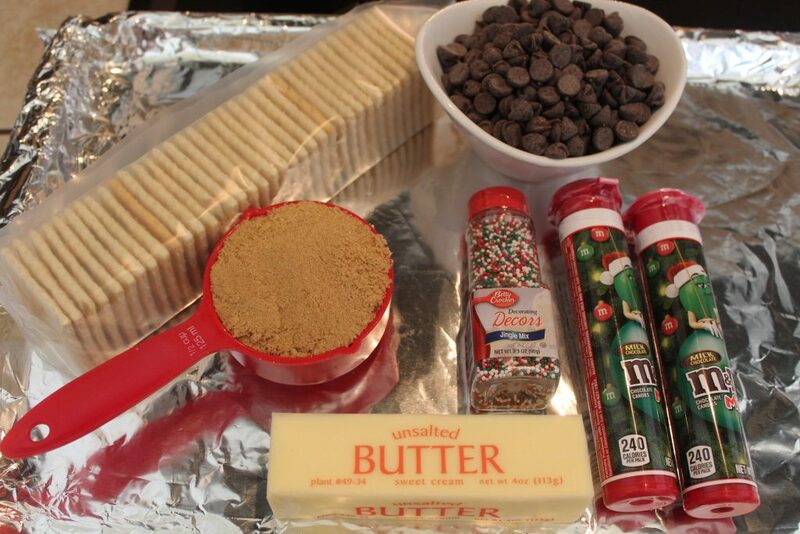 Sprinkle the chocolate chips over the hot crackers and let them sit for 5 minutes. The chocolate chips will be soft after 5 minutes and spread them with a rubber spatula. While the chocolate is still hot spread the christmas sprinkles and M&M’s ontop. Let is cool and either cut or break apart. Store in a ziplock bag or sealed container in the fridge.